Do you know that black galaxy has been trendy since 1990? Her beauty is immortal. What makes black galaxy everlasting? This kitchen has a feeling! What do you feel when you look at the picture? Picture credit: Mistones Inc.
Have you ever watch the galaxies in the open sky? This is still my favorite thing to dream about the space. The entire twinkling stars and galaxies look very lonely but peaceful. Black galaxy granite is almost like a real galaxy, very dark and has some golden –cupper tone specs. She does not relate any granite family member, so she is lonely in kitchen remodeling ideas. Black galaxy shows all the reflections like a mirror and brings such a good feeling into your kitchen, so she is peaceful. Black Galaxy granite is the sturdiest stone ever like bullet –proof that comes from South India. When the specs are smaller, she keeps her uniform rigid body. These characteristic specialties bring the best quality of her. 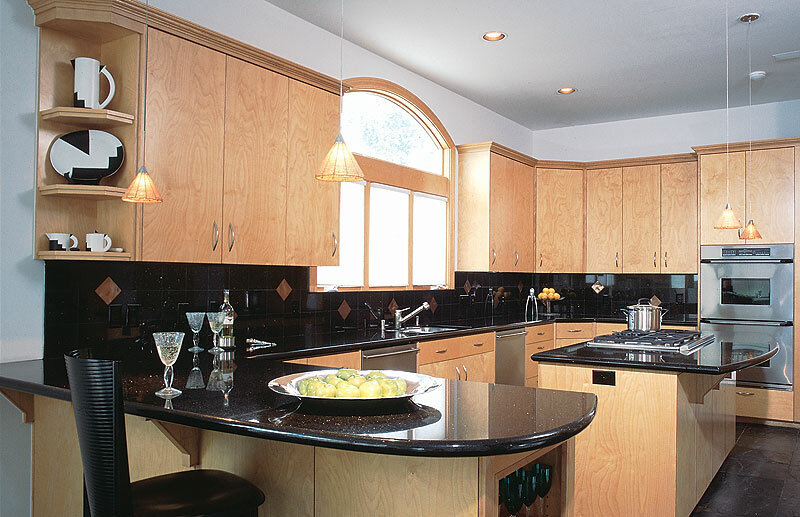 Black Galaxy granite countertop goes well with white or dark color cabinets. Since she has some good reflection, the glossy backsplashes bond better with her. However, her authentic look carries any kind of backsplash. If you have plenty recess lights, her own glory can be seen effectively. In this case, neutral color travertine backsplashes are being good choice. The only minor minus of her is showing the fingerprints or watermarks. If you are committed to clean up like religiously practicing, you can handle it. Do not forget! Every rose has its thorn. Below are my inspired works and pictures. Hope they will give you more information about this black pageant. If you are new in kitchen remodeling and would like to get more information about granite material, I may suggest you to check the Granite Countertop : Kitchen Countertop Materials article of mine. Mirror image of black galaxy, can you see the backsplash reflection against the countertop? Picture credit:Cameo Kitchens Inc.
Lovely reflections,Picture credit: 360 Services, LLC. Backsplash reflects very well on the black galaxy, nice cabinet color in coordination. Picture Credit: Fireplace and Granite Distributors. As a novelty, Black Galaxy granite is used in the wet bars to entertain your guest as much as serving like a kitchen countertop.